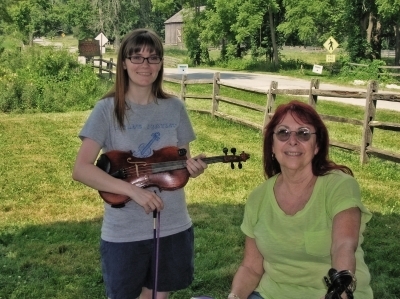 This years Music in the Valley at Hale Farm and Village in Bath, Ohio is this coming weekend. The event is free for anyone who brings an instrument. 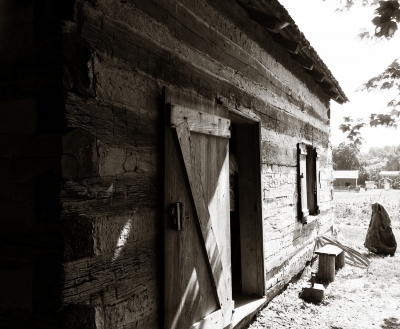 The property is broke up into two sections, split down the middle by a small country road. One side of the road is various groups sitting around playing music, the other side is hired bands and wine tasting. My goal since last year was to be well prepared for this event, but my elbow issue has really set me back more than I planned. I'm still bringing my fiddle, and the few tunes I have up to speed that I learned for this, but I can't play the whole day like I had hoped, my elbow won't allow for much playing at all. Oh well, so it goes, haha. But I'll be there, anyway. Trying to plan being there for both days. Sounds like fun. Looking forward to hearing all about it! Hopefully, your elbow won't act up but maybe bring some Ibuprofen with you to help with pain and inflammation. I find that this does the trick with many other instances and situations. Also, don't forget how important it is not to stress your body and be relaxed while playing. I've got my elbow brace, so hopefully that will help (so far I can't tell if it is helping, or making me more aware of the pain, haha), but I'll have to remember to throw some pain killers in my bag. They haven't worked on it lately, but I'm willing to try. I have my first physical therapy session today, so hopefully it'll start getting better soon... not in time for this weekend, but I'll just be happy to avoid surgery, haha. I'm normally relaxed when I play, but since I don't play around people very much, I expect I'll be pretty tense and have to keep reminding myself to loosen up. My elbow did pretty good, even without a brace (too hot, didn't want anything extra on my arm, haha). 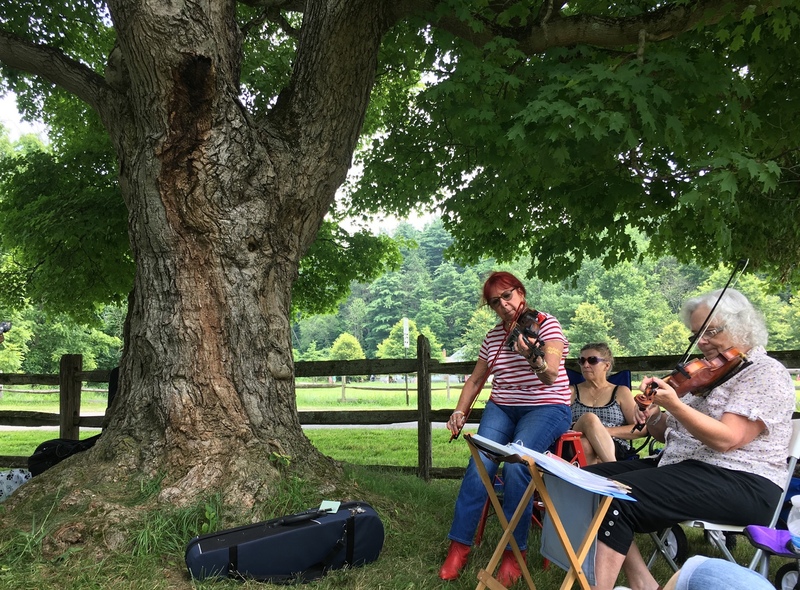 There is a group of people there that meet under the same tree every year that are really helpful to beginners, and very welcoming, so I sat in with them a little bit Saturday and a few hours Sunday. I didn't know a lot of the tunes they played, but it was fun trying to work out the tunes, and I made a few recordings of them playing tunes I'd like to work out or learn their variation. 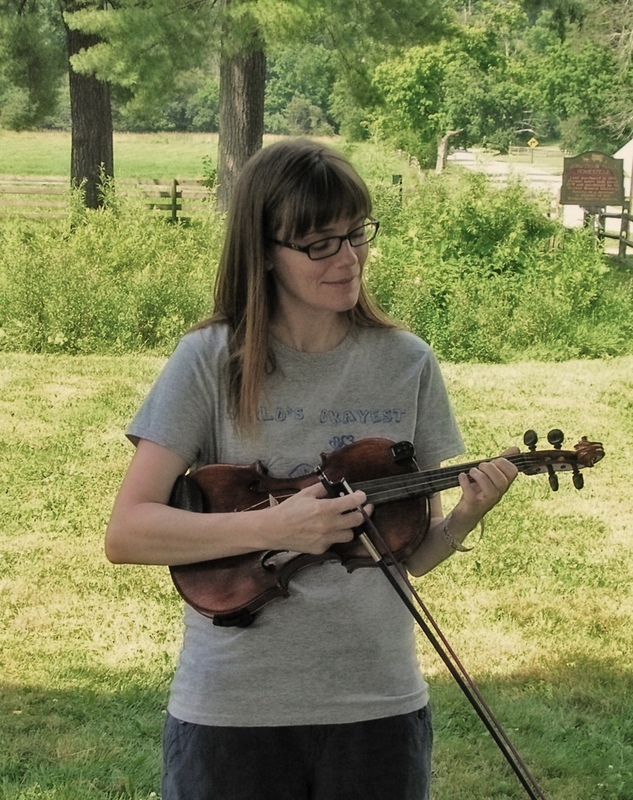 Saturday I ended up hanging out in a one room log cabin with the workers in there playing the fiddle and sharing sheet music and teaching other museum guests how to try playing the fiddle, that was all unplanned but a good way to stay out of the sun, haha. Here are a few random pictures. Two with me were taken by one of the other people in the jam under the tree. 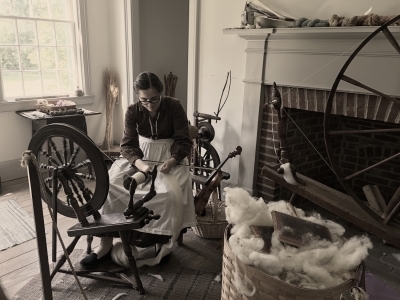 The others are the 1800s log cabin I fiddled around in, a girl spinning yarn with her fiddle next to her, and bow in her lap; and then two of the group I hung out with. PS. The purple bow I got from Fiddlershop is always a big hit here, haha. Sounds like you had a great time.. sorry I missed it. 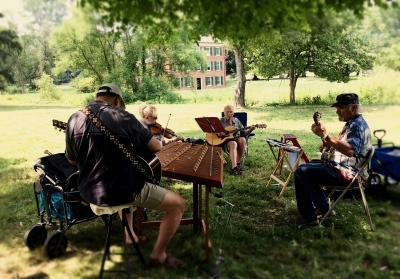 @OldOgre There is always next year 🙂 They always have it in July, and I'm going to keep working towards being able to play more tunes with them 🙂 This year was too miserable hot anyway, so you can consider yourself having been saved from that, haha. Very cool, damfino, thanks for sharing. Looking forward to seeing the clip shot by your great uncle with you in it! So glad you had a happy experience... with the other folks and with your elbow. There's this healthy breeze in the tree leaves so it actually looks nice an cool. Deceptive! @bocaholly That breeze was super helpful, but it was super hot and humid all weekend, so it wasn't as much help as everyone would have wished, haha. Everyone was pretty soaked with sweat at gross, no avoiding it, haha. We all smelled bad, hahaha. Glad you enjoyed it and I'm also looking forward to seeing the video with you in it. Looks like a gorgeous place....and a lot of fun! Happy you got to go and play. 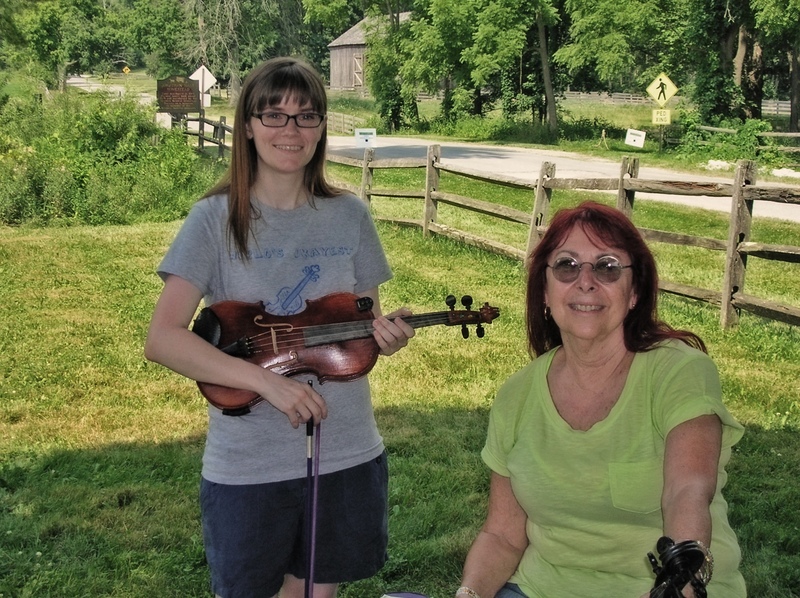 @Mimi Aysha It is a beautiful area, it's a living history museum centered around one of the homes of one of the early settlers there, in the middle of the Cuyahoga Valley National Park, so it is a beautiful setting to sit and play music. 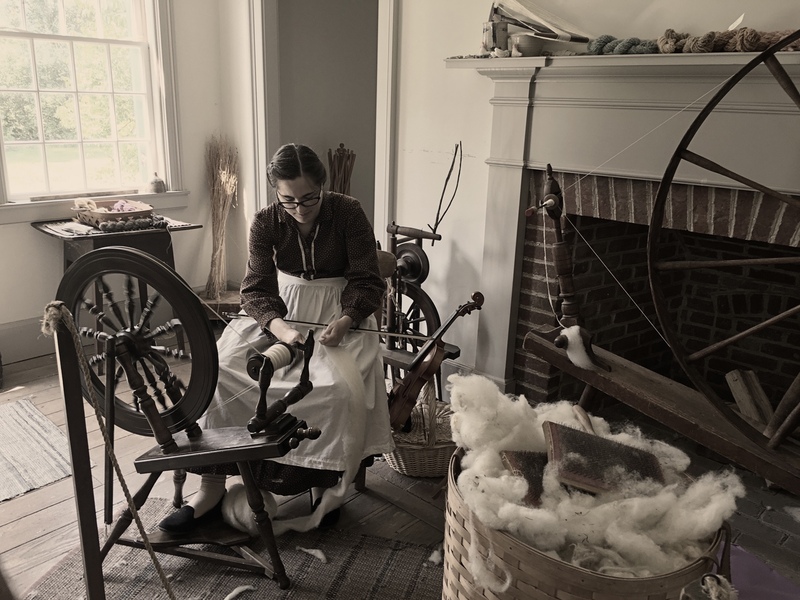 The man that settled on this land, Johnathan Hale, had been a fiddler, they said he liked to sit out on his front porch fiddling (the house is the one in the picture at the beginning of the video), and often had gatherings in his home with people playing music. So it's kind of neat to think it's just a way of carrying on his own tradition of playing music in this area. What a wonderful piece of history hidden away there, and with the great scenery, I'm sure it's just a divine place to go play!